More musicians are finding that using music apps via their smartphones is helping them increase their constant musical knowledge, practice, and learning. There are hundreds of cool music apps. Need a drum machine beat to play on your phone while you strum chords? It’s there. Want to check out guitar chart apps for increased learning? You’ll find them! If you’ve not thought about using apps to increase your musical acumen, then maybe it’s time. 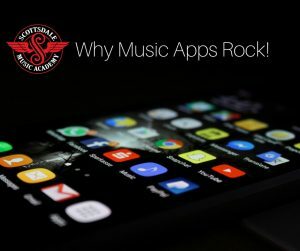 We at Scottsdale Music Academy have our favorite apps to tinker with when we’re not giving guitar lessons in Scottsdale to students who come to our facility. We’ll share some of our favorites on this blog in the coming weeks. But why should you look to apps? Smartphone apps for musicians are very helpful for increased musical knowledge. They are inexpensive (sometimes free! ), easy to use, portable and convenient. Need a portable recording app on your device to capture that song essence you came up with in the middle of the night? You can do that, and save yourself time, money and booking appointments at your local recording studio. For example, metronome apps give you a continual source of beat-keeping, helping you to build up your rhythm guitar instincts. And better yet, is that these apps are all on your phone, and not on separate devices that you have to carry around with you. For aspiring keyboard players, there are piano-learning apps (like this one) that give you a small keyboard on your phone. Such an app can keep your musical brain engaged when not in a music group situation. These are fun for awhile and somewhat intuitive, though there’s no substitute for learning piano than in private lessons at Scottsdale Music Academy. Music apps on iPhones or Android phones give musicians new opportunities to explore their muse with less cost and more convenience. Musicians can find apps that enhance the learning of drums, bass, guitar, singing, piano and more. Apps can help a musician improve over time. As long as musicians understand that phone apps won’t take the place of practice, talent, and hard work, there will be a place for music apps in today’s music-learning climate! 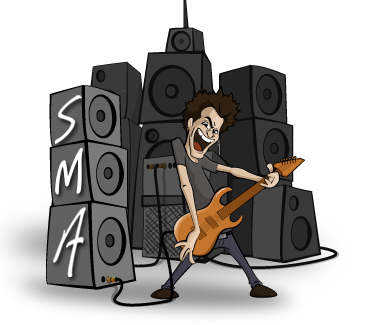 After you’re done playing with your music apps, then it’s time to get going on guitar, piano, bass or vocal lessons at Scottsdale Music Academy! Find out more at our website. Call us in Scottsdale, AZ on 602-751-3527 for a free lesson and intro tour. 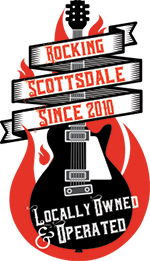 We’re Scottsdale’s leading music instruction academy in Scottsdale, between Scottsdale Road and Hayden Road.